LIAM NEESON IS set to receive a medal from Michael D Higgins and appear on the Late Late today. The Ballymena actor is to receive Presidential Distinguished Service Award for the Irish Abroad which highlights work by Irish people living overseas across a range of areas, from sport to science, charity or community support. The awards were formally presented at a ceremony at Áras an Uachtaráin on 30 November, but Neeson was unable to attend that day. 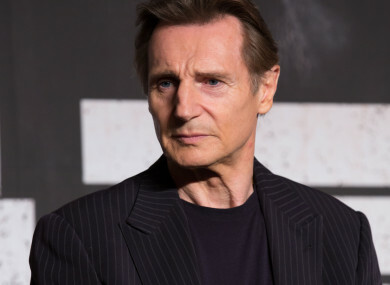 The citation for his award reads: “As an extremely gifted and internationally renowned film actor, Liam Neeson has helped to raise Ireland’s profile and awareness of Ireland and Irish artists around the world, especially in the United States where he is based. He is a strong supporter of the Lyric Theatre in Belfast, where he started his career, and the Irish Arts Centre in New York, where he currently lives. He has given his strong support in recent years for Irish cultural projects, including for the 2016 commemorations and his central involvement in the highly successful Notre Dame University documentary on the 1916 Rising. Liam has also provided strong personal support for a variety of initiatives to promote tourism to Ireland. Neeson is also scheduled to appear on the Late Late tonight. Email “Liam Neeson to receive presidential award and appear on Late Late tonight”. Feedback on “Liam Neeson to receive presidential award and appear on Late Late tonight”.